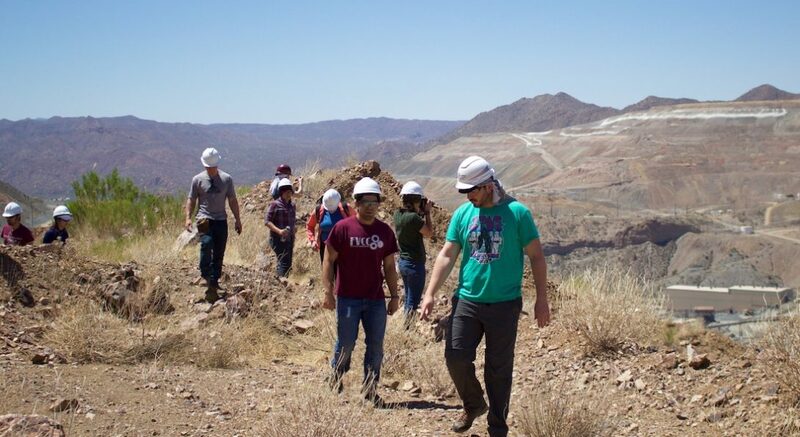 Students on Arizona field trip learning about Ray Mine, one of the largest copper mines in the world. The Earth and Environmental Sciences (EaES) major is the first step on the pathway to post-graduate work and/or employment in geoscience and environmental science. The major, or the minor, is also a valuable degree for those pursuing other career choices – for example, in medicine, public health, law, education, business, civil engineering, or social sciences. The information on these webpages is for students who have selected an EaES major or minor, who are thinking about doing so, or who are simply interested in taking one or more of our courses. Define your academic goals as early as possible to be able to meet the requirements of the College and the Department in a minimum amount of time. Meet once a semester with the Undergraduate Student Advisor: Mr. Greg Keller (3276 SES, (312) 996-4646, gkeller1@uic.edu) is available to answer questions and assist you with making a course plan and meet degree requirements. Contact the Director of Undergraduate Studies: Professor Fabien Kenig (2450 SES, (312) 996-3020, fkenig@uic.edu) is available to answer and assist you with any questions you may have about the EaES requirements and provide guidance as you plan your academic and career path. Our webpages include information on the requirements of the College of Liberal Arts and Sciences, but also consult the UIC Undergraduate Catalog and meet with a College advisor. Join the EaES listserv: Listserv e-mails contain information on internships, Department events, scholarship opportunities, etc. If you are not signed up, please contact the Director of Undergraduate Studies. Check Department Bulletin Boards: In the 2400 quadrant of SES, information on jobs, internships, scholarships, etc. is posted on Bulletin Boards throughout the hallways.